Damen Shipyards Group said it has delivered the third and fourth units in a four-vessel contract to Rotterdam-based Smit Lamnalco, a leading towage company. All four vessels are Damen’s popular and powerful ASD Tug 3212 class with a bollard pull of 80 tonnes, said a statement from the company. The order was placed in November 2017 and, with stock boats available, the first two were delivered in June and these latest arrivals in October, it said. The SL Thunggun and SL Irrong have arrived at Darwin in Australia’s Northern Territory and will shortly be heading east to the Weipa bauxite mine on the Cape York Peninsular, Queensland. Owned and operated by mining giant Rio Tinto, the mining complex exports around 30 million tonnes of bauxite each year via its own port. Currently a third site, the Amrun mine, is being constructed in an A$2.6 billion ($1.89 billion) project due for completion in 2019. The new infrastructure being built to support the mine includes a processing plant and a second terminal. Around 10, very large bulk carriers currently enter the existing port facilities each week to take on bauxite. The SL Thunggun and SL Irrong have been finished to meet Australian standards including AS 3000 electrical compliance and are certified Asbestos Free. With the tugs being kept on offshore moorings in a remote location Damen will be supplying a comprehensive support package to ensure maximum reliability. Smit Lamnalco is a long-standing client of Damen, with nearly 60 Damen vessels in its fleet. Damen also has a long history of providing tugs supporting other Rio Tinto terminals in Australia, including a number of ASD Tugs 3111 in Dampier, WA, plus a Stan Tug 2207 at Cape Cuvier, WA, and three additional ASD Tugs 3111 at Dalrymple Bay Coal Terminal, Queensland. “These are built on trust, reliability and quality. 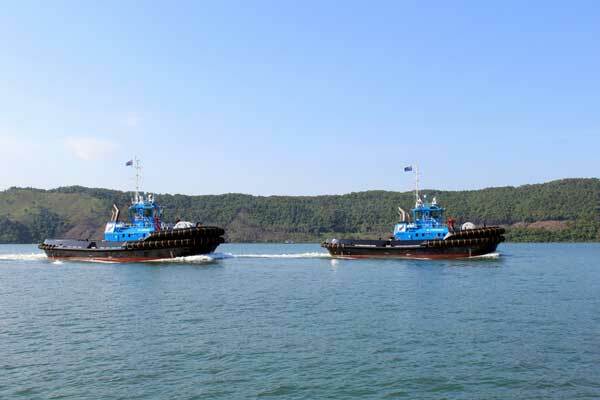 We are confident that these new tugs will be effective and efficient in their role,” he added.